Indentured investigates the living conditions of South Asian laborers working on US military bases in Iraq. 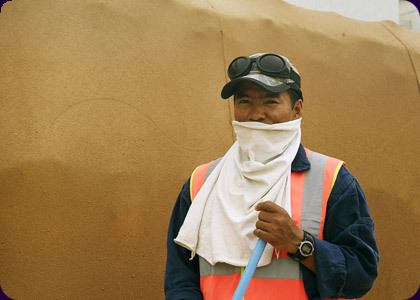 Thousands of nameless workers, called "Third Country Nationals" because they're neither American nor Iraqi, toil inside US bases in Iraq as food servers, custodians, construction workers and more. But unlike American contractors who often make six figure salaries in Iraq, these men typically make less than two dollars an hour. Nepalese custodians talk about the illegal broker's fees they had to pay to get their jobs on the base. Inside a company-run camp a Nepalese supervisor explains how they are brought into Iraq against Nepalese and Iraqi law. Cy Kuckenbaker was the recipient of a Fulbright Fellowship in 2004 and was a US Peace Corps Volunteer from 2000–2002. He received his MFA in filmmaking from the film direction program at the California Institute of the Arts. His film The Orphans premiered at New York's Museum of Modern Art in 2006 and went on to screen at the Pompidou in Paris, the Los Angeles International, Calgary International, Edmonton International, and Viennale film festivals. In 2006, LA Times film columnist Robert Abele called Cy's graduate thesis film The Orphans, "the bright spot" in the Cal Arts' 30-year retrospective.